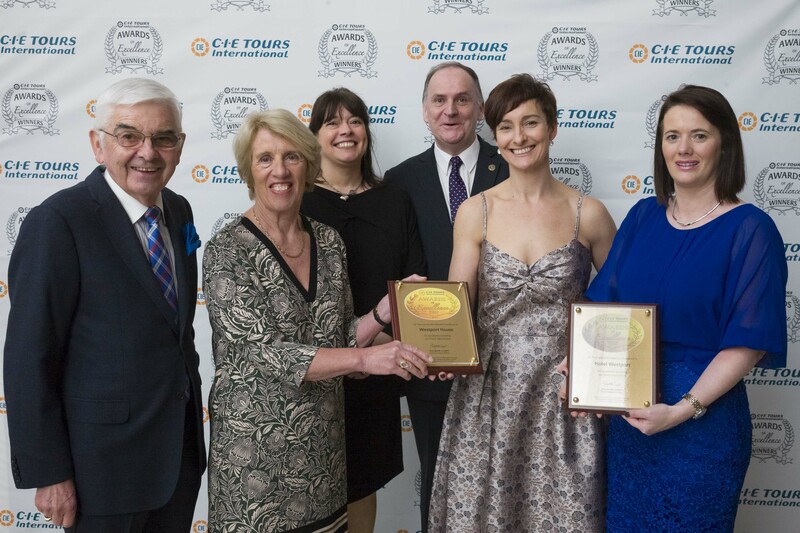 At a reception in Dublin City Hall on Monday night, Elizabeth Crabill, Chief Executive Officer of CIE Tours International, presented Hotel Westport & Westport House each with Merit Awards at their Annual Awards of Excellence. 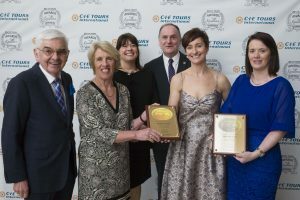 Now in its 29th year, the annual awards of excellence recognise the best hotels and attractions across Ireland and are based on customer feedback from over 32,000 customers throughout the year. 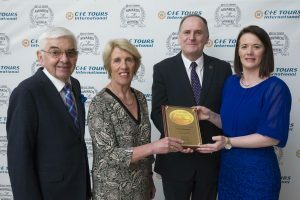 Peter Malone, Board Member of CIE Tours International, and Vivienne Jupp, Chair CIE Tours International, present Declan Heneghan and Eithne Cosgrove of the Hotel Westport, with their award at the CIE Tours International 29th Annual Awards of Excellence. Declan Heneghan, General Manager of Hotel Westport, commented on the “consistency, hard work and commitment to high standards of the Hotel team” demonstrated by the fact that is the 10th year in a row that it has received this Award of Excellence. Further, this week the hotel accommodation team were awarded a Gold Standard Award by the Irish Accommodation Services Institute (I.A.S.I.) and the kitchen team were honoured for a seventh year with an A.A. Rosette for culinary excellence. 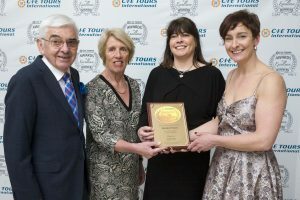 Peter Malone , Board Member of CIE Tours International, and Vivienne Jupp, Chair CIE Tours International, present Joan Collins and Biddy Hughes of Westport House, with their award at the CIE Tours International 29th Annual Awards of Excellence. Set in the lush 400 acre estate, Hotel Westport & Westport House each complement the other to make visitors’ stays in Westport truly unforgettable. Four-star Hotel Westport offers beautiful rooms (129), a luxurious spa and fine dining. In the heart of Westport, it is located on the grounds of Ireland’s most beautiful home: Westport House. The museum house brings visitors back in time to the 18th century with a fascinating story and the opportunity to experience Victorian Tea or special occasion dining.